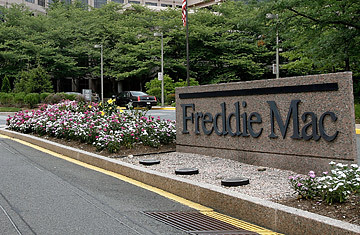 Freddie Mac: Government's New Black Hole? Freddie Mac's headquarters in McLean, Va.
AIG is to date the most expensive corporate bailout in American history, requiring $180 billion in government funds. But it may soon have competition. Last week mortgage giant Freddie Mac said it had lost $50 billion in 2008 alone. A look at the company's books suggests the government will have to spend at least triple that much to save the financial firm from collapse. If the housing market worsens, the tab could be even larger. "Freddie's portfolio of [mortgage] insurance is more risky than the market was led to believe," says Paul Miller, an analyst at FBR Capital Markets. Sister company Fannie Mae lost even more last year, with $58.7 billion of red ink. But Fannie was better capitalized than Freddie going into the credit crunch. So even though Freddie by many measures is smaller than Fannie, the problems at Freddie will probably end up costing more. And like AIG, Freddie has had to go back to the government a number of times with cup in hand. The mortgage giant has already received $14 billion in government aid. After a fourth-quarter loss of $24 billion, the company said it needed an additional $31 billion from the government to keep the lights on. Another bet that didn't pay off for Freddie was on interest rates. The firm's managers bought derivatives that would pay out if interest rates rose. Instead, a global financial meltdown has caused interest rates to plummet. That resulted in a $15 billion loss for Freddie from its hedges. Freddie lost $1 billion more on bonds tied to short-term loans made to Lehman Brothers. Like Lehman, that investment went belly up. Then there are all the houses it has to repossess as people stop paying their mortgages. The company now owns about 30,000 homes. Maintaining these houses costs about $3,300 a month each, and that comes on top of the loan loss, which is typically about one-third the size of the mortgage. Wave goodbye to another billion. When will the red ink at Freddie stop? It's hard to say. In its most recent annual report, the company said that if it had to mark all its assets to the price similar bonds are trading for in the market, the company's net worth would sink by an additional $65 billion. But Freddie's bottom-line woes may run even deeper. Freddie has $38 billion in losses it has yet to acknowledge in its investment portfolio. The firm also has $48 billion in nonperforming loans that it either holds or has guaranteed against. In a painful stroke of irony, there is a $15.4 billion line item for deferred taxes on the asset side of Freddie's balance sheet. That means Freddie is still hoping to claim $15 billion in write-offs against future profits. But since Freddie continues to lose money and is now part of the government, the likelihood that it will have to pay taxes anytime soon is probably nil. Add up all those items, and it becomes apparent that the government will probably spend more than $100 billion in additional funds cleaning up the mess at Freddie. "The losses at Freddie show the pressure the banking system as a whole is under," says Fred Cannon, chief equity strategist at Keefe, Bruyette & Woods. "Freddie is going to need more capital, but they are not alone."